Because of SafeDisc DRM the game may not work on newer versions of Windows and a No-CD fix may be required to run it. A demo is available here, here, here or here. It features one single player map (The Tholos Temple) and one multiplayer map (The Rotunda). Install the latest patch 1.2. It includes all the previous updates from patch 1.1. Disables switching between high and low detailed models for enemies and other dynamic objects depending on distance from the player. The game will render highest detail models all the time. Run in windowed mode and use Borderless Gaming. Built-in full scene AA doesn't work. Force in the graphics card control panel. Frame rate is capped at 250 FPS. Game is stretched in widescreen resolutions, use WSGF modified executable for a proper Hor+ FOV fix. The following method doesn't work with the WSGF modified executable. Vertical and horizontal FOV values can be changed individually, increasing the horizontal value fixes screen stretching on widescreen resolutions, but the HUD and menus remain stretched. 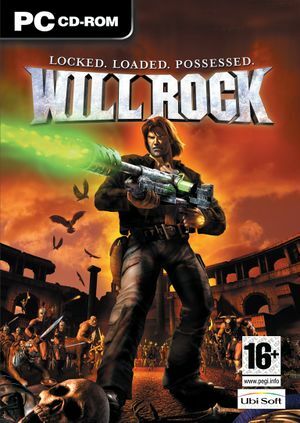 Launch the game and add willrock.exe process to Cheat Engine. Double click the found result to add it to table list. In the table list copy and paste it and set "adjust the address by" to -4 to get the horizontal FOV address (it should point to value 75). Change the values as you wish (increasing the horizontal value to 90 is good for 16:9 screens). The game changes these values when zooming in/out with the sniper and during cut-scenes. Set a hotkey in Cheat Engine to quickly change back to desired values when it happens. Audio sliders for sound effects and music. Up to 16 players. Co-op mode has limit of 4 players. Included with patch 1.1 and later. In the options menu selecting the "game" submenu crashes the game.